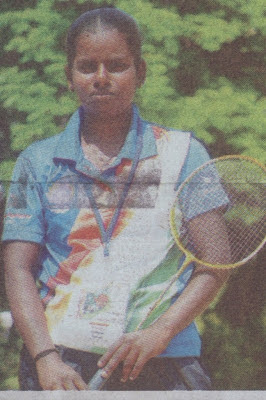 Sindhu Kumari a student of Asha Deepam, Trichy, won a silver medal for badminton doubles during the National Games for all Disabilities at the SDAT Stadium in Chennai, on Feb. 19. This event was initiated by the union ministry of youth affairs and sports to bring Paralympics, Special Olympics and the All India Sports Council of the Deaf under a common roof. Hearing impaired and slightly autistic, Sindhu (18) won a bronze during the Special Olympics in Athens last year. Bharatanatyam (classical dance) is her first love and she is looking forward to a two-year course in bharatanatyam which commences in May. Sabina Mattappallil, SCN, would find the means to finance her education. Sindhu lives with her older brother and mother after her father deserted the family. “Though denied simple joys, their uncomplaining attitude is worth imbibing”, said one of the coaches. For Sindhu, life never fails to inspire and no dream is too big to achieve. The Times of India newspaper featured her on Feb. 19.